• After the 6 days war in 1967 Israel occupied the West Bank. In 1968 a Rabbi called Moshe Levinger came to Hebron and rented a room in a hotel in Ein-Sarah street to hold a Passover Seder there. After that he refused to leave. In a deal with the Israeli government, he moved with his family and followers to a former army base on a hill just northeast of Hebron, where, with the state’s cooperation, they established the settlement of Kiryat Arba – one of the first settlements in the West Bank. • According to the 4th Geneva Convention (which is part of the international humanitarian law) it is illegal for an occupying force to move its citizens into occupied territory. Because the West Bank is under military occupation by Israel, all Jewish settlements here are illegal. • From 1970s onward, the Israeli government, which was at first reluctant to authorize a settlement in Hebron because they feared Palestinian uprisings, approved the construction of Kiryat Arba outside the city, as some sort of compromise: to avoid settlers going into the Arabic city centre and causing conflicts there, but still allowing them to live close to the Grave of Abraham. • In 1979, however, Levinger’s wife Miriam and a group of women and children occupied an abandoned hospital in the city centre. It used to to house a clinic serving Jews and Arabs until the riots of 1929. The group of 40 women and children moved into the building illegally and lived without water or electricity for a year. In 1980 six Jews were murdered outside the building, and after that the Israeli Government decided to allow Jews to live in Hebron and restore the buildings. They later obtained authorisation for a permanent settlement. This is the first inner city settlement in Hebron, Beit Hadassah, which you can see on the maps. About 31 families live here. It also houses the Hebron Heritage Museum, a library, school and synagogue. 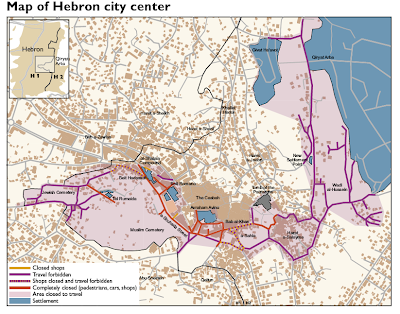 From then until now, Hebron is the only Palestinian city with settlements inside the city centre – not only on the outskirts surrounding the city. • Today there are four settlements in the city centre: in the Old City and Tel Rumeida. The population here consists of 40 000 Palestinians and 4-500 settlers, protected and escorted by 1700 - 2200 Israeli Defence Soldiers. • Beit Romano was originally a building constructed by a Turkish Jew, Avraham Romano, as a home for the elderly, in 1879. During the 1929 riots the British authorities collected the remaining Hebron Jews in the Beit Romano courtyard before evacuating them to Jerusalem. After the murder of six Jews near Beit Hadassah in 1980 the Israeli government restored Beit Romano as a new settlement for the Jews. It is now a "yeshiva" – a religious school – for 250 students, and a military camp. Also, five settler families live in caravans within the military camp. They have lived there for 10 years and use the same gate as the soldiers, which is not really legal. Currently Tel Rumeida has been declared a closed military zone until December 2009. • One main road runs through H2 and connects the western and eastern part of the city: Al-Shuhada Street. Three of the four settlements are located here, and Shuhada is tightly controlled by the IDF. After the second intifada began in 2000 the street was "sterilised." Doors to Palestinian homes were welded shut and Palestinians were not allowed to drive on the street, nor walk along most parts of it. • The old market, Old Souk, situated inside the Old City (the Qasba) behind the Shuhada street used to be the busiest commercial centre in the West Bank. However, the vegetable and fruit market adjacent to the Old Souk has been closed by Israel due to security considerations. Israel has also imposed 101 closures of entrances into the Old Souq. Shops have also been closed either by military order, or ‘voluntarily’ because of all these closures which of course means a serious drop of business. • Because of all these closures and restrictions of movement 44% of the Palestinian families have moved out of the Shuhada street and the Old Souk. 1,014 houses have been vacated. 1829 shops are closed. That is why the Old City of Hebron now often is referred to as the Ghost Town. To reverse this development, Palestinian local authorities have made efforts to renovate, rehabilitate and develop the Old City, subsidise shop owners and families to encourage them to keep living there. This is done by the Hebron Rehabilitation Centre – which produced the brochure you got earlier. 1800 Palestinian families (about 13,000 people) in H2 get food aid from the UN.